Thread: Luftwaffe Heavy bombers & transports. The Luftwaffe's most serious shorcoming was the lack of an efficient heavy-bomber fleet. The Dornier Do.19 was an intriguing possibility that, due to several causes, never panned out. Generalleutnant Walther Weaver, the Luftwaffe's first Chief of Staff was the most persistent advocate of a German long-range strategic bomber fleet, like the ones being developed in Britain and the USA. Largely because of Weaver, the RLM Technisch Amt issued a specification for a four-engine heavy bomber. Both Dornier and Junkers were competitors for the contract, and each received an order for three prototypes in late 1935. The Dornier design was given the project number of Do.19, while the Junkers prototype became the Ju-89. The Dornier Do.19 was a mid-wing cantilever design, and was mostly metal in construction. It had a rectangular-section fuselage and a tail unit with braced twin fins and rudders. These were mounted on the upper surface of the tail plane. It also had retractable landing gear, including the tailwheel. The powerplant was four BMW 332H-2 radial engines, that were mounted in nacelles at the leading edges of the wings. It had a crew of nine, which would have consisted of a pilot, co-pilot, navigator, bombardier, radio operator and five gunners. The V1 prototype flew on the 28th of October, 1936. When Generalleutnant Weaver died in an airplane crash, the heavy bomber program lost it's momentum, and was not to recover. When the Luftwaffe was given it's heavy blow over the skies of England, the error of not having heavy bombers became apparent. But by then it was too late in the day to develop the bombers required. Albert Kesselring, Weaver's successor, believed that what Germany required was more fighters and tactical bombers. Therefore the V2 and V3 prototypes were scrapped. The original V1 became a transport in 1938. The Dornier Do.19 was only built in prototype form , yet it was a promising design that could have yielded not only a useful long-range bomber, but the desperately needed experience in a field where the Luftwaffe failed to shine. The need for a Langstrecken-Grossbomber, heavy strategic bomber was controversly discussed within Luftwaffe for years. In November 1933 the RLM started discussions with Junkers and Dornier about the requirements of such aircraft. Due to this discussions Dornier developed the Dornier Do 19, while Junkers started the development of the Junkers Ju89. The RLM request asked for two prototypes and a prototype series of nine aircraft. On Apri, 11th 1937 the Ju89 prototype D-AFIT (V1, c/n 4911) was first flown by Hesselbach. Short time after the first flight, on April 29th 1937 the further developement of both strategic bombers was cancelled by the RLM. The reason for this step was the high fuel consumption of heavy bombers, as well as the fact, that a large number of bomber aircraft could only be manufactured if these bombers were medium seized bombers, like the Ju88. The second Ju89 prototype D-ALAT was finished in July 1937, but the third prototype V3 was stopped after the program was cancelled. Both prototypes were used for extensive flight tests to get experiences about the stability and flight controls of large aircraft. On June 4th 1938 it achieved a new Payload/Altitude World Record with the second prototype D-ALAT with 5000 kg payload at an altitude of 9312 m. ( 4000 meters more than a Short stirling with the same payload) On June, 8th 1938 he reached with the same aircraft an altitude of 7242 m with 10000 kg. In late 1938 both aircraft were transfered to Luftwaffe, where they were used as heavy transport aircraft until summer 1939, when they were probably scrapped. Some sources also mention, that both aircraft were still used during 1940 in Norway. Following the development stop of the strategic bomber, the Ju89 design was used for a Lufthansa request for a large passenger aircraft. The Ju 89 was the best performing of the two Ural bomber prototypes and after the cancellation of the project on 29th April 1937 the V1 and V2 prototypes continued to carry out flying trials and briefly served with the transport unit KGrzbV 105 during the Norway invasion. The V3 prototype was used in the development of the Ju-90 transport. Contrary to popular belief it was not Albert Kesselring who killed off the Ural bomber, rather it was Herman Goering upon the advice of Kesselring, Udet and Milch. Kesselring was a vocal supporter of twin engine bombers and backed up Udet who preferred dive bombers. This was why disastourous decision was made to convert the Ju 88 into a dive bomber. Milch on the other hand wanted the project cancelled simply because at that stage the German aero industry was incapable and would remain so, of building a large fleet of heavy bombers. Thus Goering shelved the project and later said, "The Fuhrer will never ask me how big our bombers are, but how many we have." In late 1943 Goering would bemoan the lack of a heavy bomber fleet and curse those who told him the medium bomber was superior to the heavy bomber. "Well those inferior heavy bombers of the other side are doing a wonderful job of wrecking Germany from end to end," was his acid tongued response. Of course the German heavy bomber projects were not dead. After pleas from the Chief Of the Branch 1 of Luftwaffe Operations Staff Major Paul Deichmann to Goering an amazing about face occurred in late 1937 when specifications were issued to develop an aircraft to deliver a 5 ton bomb load to New York. The Ju-88 wasnt bad divebombing, the problem come when some idiot want that a plane big and heavy as He-177 should have the divebombing abilities....crazy. And yes the lack of a devoted 4 engined aircraft put an incredible strain in several 2 engines designs like the "B" bombers. In July 1939 the RLM issued a specification for a new medium bomber. It was to have a maximum speed of 600 km/h (373 mph) and be able to carry a bomb load of 4000 kg (8820 lbs) to any part of Britain from bases in France or Norway. Furthermore, the new bomber was to have a pressurized crew compartment, remote control armament and was to utilize two of the new 2500 horsepower class of engines then being developed (Jumo 222 or Daimler Benz DB 604). 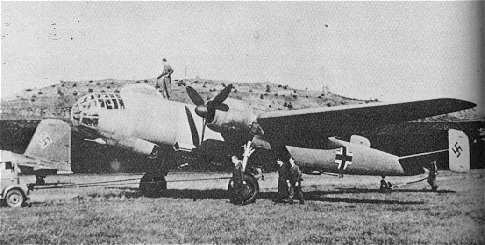 This was the "Bomber B" program, which Arado, Dornier, Focke-Wulf and Junkers participated in. The Arado Ar E.340 was eliminated, the Dornier Do 317 was put on a low-priority development contract; and the Junkers Ju 288 and Focke-Wulf Fw 191 were chosen for full development. Dipl. Ing E. Kösel, who also worked on the Fw 189 reconnaissance plane, led the design team for the Fw 191. Overall, the Fw 191 was a clean, all metal aircraft that featured a shoulder mounted wing. Two 24 cylinder Jumo 222 engines (which showed more promise than the DB 604 engines) were mounted in nacelles on the wings. An interesting feature was the inclusion of the Multhopp-Klappe, an ingenious form of combined landing flap and dive brake, which was developed by Hans Multhopp. The entire fuel supply was carried in five tanks located above the internal bomb bay, and in two tanks in the wing between the engine nacelles and fuselage. The tail section was of a twin fins and rudders design, with the tailplane having a small amount of dihedral. The main landing gear retracted to the rear and rotated 90 degrees to lie flat in each engine nacelle. Also, the tailwheel retracted forwards into the fuselage. A crew of four sat in the pressurized cockpit, and a large Plexiglas dome was provided for the navigator; also the radio operator could use this dome to aim the remote controlled rear guns. Armament was to consist of a remote controlled chin turret (two MG 81 7.9mm machine guns), a similar turret in the rear of each engine nacelle, an upper and lower turret featuring a single MG 151/20 20mm cannon and two MG 131 13mm machine guns. Problems arose almost immediately when the Jumo 222 engines were not ready in time for the first flight tests, so a pair of 1600 horsepower BMW 801MA radial engines were fitted. This made the FW 191 V1 seriously underpowered. Another problem arose with the RLM's insistence that all systems that would normally be hydraulic or mechanically activated should be operated by electric motors. The installation of so many electric motors and wiring led to the nickname for the Fw 191 of "Das fliegende Kraftwerk" (the flying powerstation)! This also had the detrimental effect of adding even more weight to the overburdened airframe, plus there was also the danger of a single enemy bullet putting every system out of action if the generator was hit. Dipl. Ing Melhorn took the Fw 191 V1 on its maiden flight early in 1942, with immediate problems arising from the lower rated engines not providing enough power, as was anticipated. One surprising problem that was encountered were the Multhopp-Klappe, which presented severe flutter problems when extended, and pointed to the need for a redesign. At this point, only dummy gun installations were fitted and no bomb load was carried. After completing ten test flights, the Fw 191 V1 was joined by the similar V2 , but only a total of ten hours of test flight time was logged. Since the Jumo 222 engines were having a lot of teething problems, and the Daimler Benz DB 604 had already been abandoned, a new proposal was put forth for the Fw 191B series. The V7 through V12 machines were abandoned in favor of using the Fw 191 V13 to install a pair of Daimler Benz DB 606 or 610 engines, which were basically coupled pairs of either DB 601 or 605 12 cylinder engines. Their lower power-to-weight ratio, however, meant that the armament and payload would have to be reduced. It had already been decided to delete the engine nacelle gun turrets, and to make the rest manually operated. Five more prototypes were planned with the new engine arrangement, V14 through V18, but none were ever built. One final attempt was made to save the Fw 191 program, this time the Fw 191C was proposed as a four engined aircraft, using either the 1340 horsepower Jumo 211F, the 1300 horsepower DB 601E, the 1475 horsepower DB 605A or the 1475 horsepower DB 628 engines. Also, the cabin would be unpressurized and the guns manually operated; a rear step in the bottom of the deepened fuselage being provided for the gunner. Unfortunately, at this time, the whole "Bomber B" program had been canceled, due mainly to no engines of the 2500 horsepower class being available, which was one of the primary requirements in the "Bomber B" program. Although the Fw 191 will be remembered as a failure, the air frame and overall design eventually proved themselves to be sound, only the underpowered engines and insistence on electric motors to operate all the systems eventually dooming the aircraft. All in all, there were only three Fw 191s ever built (V1, V2 and V6), and no examples of the Fw 191B or C ever advanced past the design stage. Dorsal and ventral barbettes, each with a 20mm MG 151 cannon flanked by two 7.92mm MG 81, Two twin MG 81 barbettes in the tail of the engine nacelles, and a chin barbette with another pair of MG 81. I think mate this is the real reason why the Germnany closed its program of heavy bombers. The resources of whole Germany did not let to build this kind of airkraft mass. I know for sure the analogical soviet program was refusing on simular reasons. The materials which were demanded for the building of one soviet Pe-8 was equivalent for the bilding of 30(!!!) fighetrs like Mig-3 and 15 (!!!) IL-2. The simple arihmethic gives you conclusion the Germay could not biulded the a lot of J-89 without seriouse damage for the other aviation. I have to conclude the Germans had a right desicion to refuse the own strategic bombers project. I dont know if was right, but in 1937 there was no many options, the engine industries were particulary weak in those times. The obligations of the Treaty of Versailles impacted directly on the German aero industry. While clandestine design work continued after the war, there was hardly enough funding to go around. Engine design suffered enormously as a consequence and every major engine development up to 1945 suffered a tortuous development path littered with problems. This is why certain aircraft were delayed in development and deployment. This was particuarly true of the Me-262. The Jumo 004 engine was still under development and experiencing major teething problems when the Me 262 was introduced to service. I agree but they still managed to get the first operative jet fighters, and the first operative recce-bomber A/C. 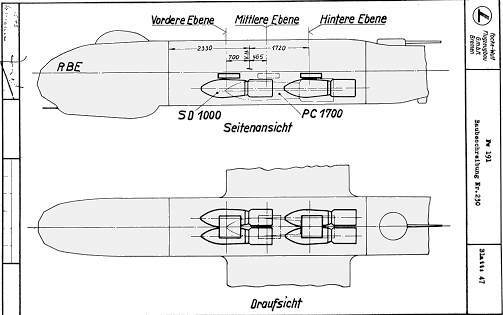 This pages belong to: "warplanes of the Luftwaffe"
A detailed video in russian about the Fw-200 and his armament. During the developement of the ju-89 Lufthansa became interested in a similar aircraft for transport purposes. Already in 1935 Luftwaffe decided to offer the Ju89V3 to Lufthansa for test flights. Probably it was intended to use the Ju89V3 as a pure cargo aircraft at this time. But when the Ju89 programme was abandoned by Luftwaffe in April 1937, the Ju89V3 underwent major changes, which made it useable as a widebody passenger aircraft. Wings and tails were taken from the original Ju89 design, while the fuselage was a complete new construction and which was much brider than the original Ju89 fuselage. This new design was designated as Ju 90. The Ju90V1, which was original the Ju89V3, was first flown on August 28th 1937 . During the following flight tests, this prototype crashed on February 7th 1938 due to structural failure during overspeed. The second prototype was delivered to Lufthansa in May 1938 for operational test flights. This second prototype also crashed on November 21st 1938 during tropical flight tests at Bathurst due to an engine failure during take off. In November 1938 Lufthansa ordered three Junkers Ju90, a further Ju90 was ordered by RLM for flight tests. This aircraft was later also taken over by Lufthansa. South African Airways ordered a further two Junkers Ju90 with Twin Wasp engines. These two aircraft were not delivered until the breakout of WWII and both later went to Luftwaffe. Lufthansa finally ordered a total of 12 Junkers Ju90. Just six were delivered until September 1939. These aircraft were transfered to Luftwaffe together with further deliveries from Junkers. They were used during the occupation of Norway as transport aircraft. Some of them later returned to Lufthansa for a few months, but finally all Ju90s were taken over from Luftwaffe. In April 1939 the RLM asked Junkers for a further developement of the Ju90 for military transport purposes. The Ju90V5 and V6, also known as Ju90B were the prototypes of this military design. They got a new wing and a BMW139 engine instead of the older BMW132. Modifications were also made at the tail unit and the undercarriage. The V5 flew first on December 5th 1939. A special equipment of the Ju90V6 was a boarding ramp in the floor of the fuselage. This ramp could be used to load cars and larger cargo freight. A further two prototypes (V7, V8) were ordered by Luftwaffe. Again these prototypes were equipped with a modified wing with increased span. The V8 was also equipped with machine gun towers for self defense. Actually the Ju90V8 was introduced as the Ju90 bomber version, known as Ju90S. These two prototypes flew first in September 1941. Delays were caused due to intensive modifications of the original Ju90 design and probably due to problems with the developement of the Ju88 programme. Junkers got an additional RLM request for a further two prototypes (V9, V10), which seemed to be dropped at the beginning of WWII. Ju-90B in iraqui markings, this aircraft carried supplies for an spacial detachment of Bf-110 whom provide support to the iraqui insurgent in 1941. A Ju-90B in trouble, the splashes in the foreground are caused by RAF fighters, this aircraft carried supplies to Rommel, the Ju-90 could transport the same cargo as 7 Ju-52/3m. V7 in flight with the open rear ramp. JU-90V8, this armed transport was the prototipe for the future Ju-290. It had an MG-151 and 5 MG 131. The wingspan was increased 7 meters.